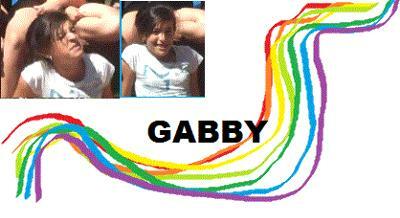 Goodbye Gabby, from your twice home to your also once before home! You're bubbly, fun, and adventurous with your from-deck-to-trampoline-diving, and swing-to-trampoline-crashing-epically-failing!!! You were the life of the party anywhere you went!! Don't worry-- you will never be forgotten here, or there, or ANYWHERE! We'll always remember, "The Girl of the 5 Page Card," "The Girl Whose Candle Would Not Light," & "The Girl Who Jumped-- TWICE!!" Comments for Goodbye Gabby, from your twice home to your also once before home! Yankees are still the best!! I'm sure by the title you already know who i am. I hope that you have a great time back in Arizona. Me and Natalie will try to visit. Call or text me anytime 540-847-1623. Hey its karah im gonna miss you sooooo much we had such great times this year. I just hate to see them leave. I hope you can go to the mall with me before you leave! CMS wont be the same with out you! Were all gonna miss you soooo much!!!!!!!!! Hey Gabby! I'm really gonna miss u!!! Just remember I'm ur insane negative BFFA <333 ! Hi! i miss you! your visiting va without me! Hi! Its obviously hannah so i hope your having fun in az well actually i just heard you in VA WITHOUT ME!jk its ok i hope you having fun!i miss you.